Liquid Carbon Dioxide (CO2) is normally available from large refineries, chemical plants as a by-product and distributed by trucks to its point of use. Long distances, irregular supply, logistic problems or simply not available, then this is a clear challenge to install a stand alone CO2-Production Plant to produce your own food grade CO2 locally. Such an in-house CO2-Production Plant will then be a huge benefit to overcome CO2-shortages, it will be always available in time at a very low price when using the right quality of plant. There are many important factors to ensure that the production costs of CO2 are as low as possible, and in addition, the CO2 quality must meet the international quality standards. Besides our international knowledge in setting up a CO2-Production Site, we are also providing the right feasibility study to ensure that your CO2 project will become a master piece turning into a profitable CO2-Business. Try us on your next project ! 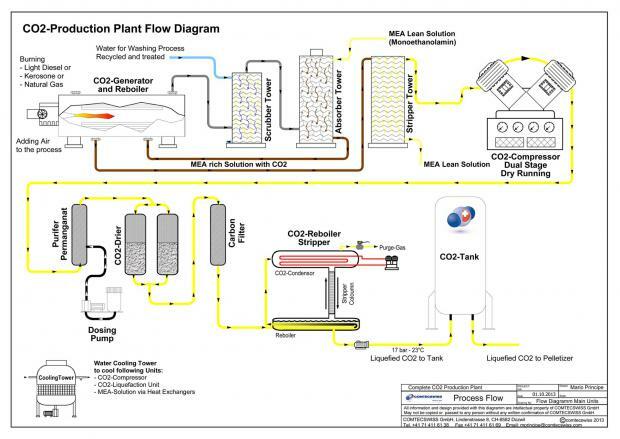 With the flowchart below, we would like to simply introduce the process structure of a fullly automatic operating CO2-Production Plant burning light diesel, natural gas and/or kerosene. This controlled combustion process will generate flue gas with a high CO2 content. The fluegas will be washed first with water. At the next stage, the use of a cold, chemical absorbent "MEA" only recovers CO2 out of the flue gas which is at a later stage released from its absorbent by adding heat. The MEA solution is circulating and can be reused. The released CO2-Gas will be purified, compressed and dried in serveral defined steps and passes the liquefaction section to become liquid. 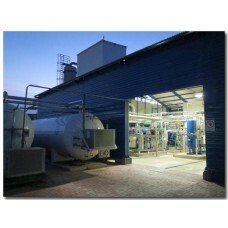 Liquid CO2 will then be stored in a CO2-storage tank for further use.